Service Description Wordpress Services: 1. Creating the wordpress themes. 2. Converting a psd into a wordpress theme. 3. Creating the wordpress plugins. 4. Creating the shopping carts for the wordpress themes. 5. Performing the cross-browser coding. 6. Customizating the wordpress themes and plugins. 7. Creating easy-to-use admin panels for the wordpress themes. 8. Writing js (jquery) scripts for themes and plugins. 9. 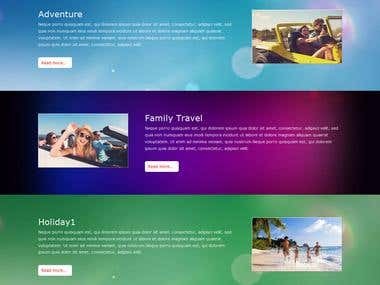 Js implementing various effects such as slide effect, fade effect, carousel etc. 10. Integrating the blog with social networks such as facebook (login, share, like, posting) and twitter (rss, feed) etc. 11. Video and audio adding to blog's pages. 12. Font replace systems implementating (cufon, font face). 13. Creating the custom widgets such as calendar, events etc. 14. Integrating with mailchimp, constant contact etc. 15. Transferring the sites to another hosting (another domain). 16. Transferring a site db, importing the content from another cms, mysql db.